Conosca il pittoresca Jasper in un breve giro turistico prima di dirigersi verso il lago Maligne. Una crociera guidata offre una vista eccellente della bella costa con fitte foreste e cime glaciali che salgono ripide dal bordo dell'acqua. Non dimenticare la tua fotocamera, poiché le opportunità per le spettacolari foto di paesaggi sono infinite! Un breve tour di Jasper ti offre una panoramica ideale di questa affascinante città di montagna. Quindi attraversate il fiume Athabasca fino al Maligne Canyon per una passeggiata lungo la stretta gola calcarea; attraversa due ponti sul Canyon per ammirare le magnifiche cascate sottostanti. Sosta al punto panoramico di Medicine Lake per ammirare le catene montuose Colin e Queen Elizabeth. La tua crociera sul lago Maligne è rilassante e stimolante. 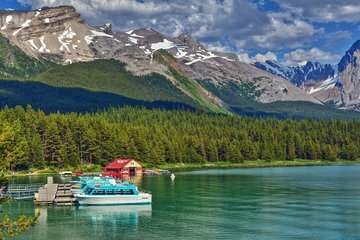 Spirit Island con le frastagliate Montagne Rocciose canadesi come sfondo, è una delle immagini più rappresentative di tutto il Canada. Qui andrai a riva per catturare le tue foto e i ricordi di questo posto speciale. Tieni d'occhio tutti i tipi di animali selvatici - aquile, alci, coyote, lupi, cervi e orsi - mentre fai ritorno a Jasper. Questo tour stagionale si svolge nei mesi caldi di giugno fino a settembre. Jasper city part of the tour was not good- the hospital, school and a couple of churches were pointed out. Maligne Lake was OK. Stunning views. Brilliant tour, fully recommend this. My wife and I really enjoyed this tour and I'm sure anyone going on it would too. Our guides, Bianca and especially Dustin were interesting, humorous and had plenty of anecdotes about life in Jasper, like when out on a run don't surprise a bear! From the title of this tour I expected we'd be taken around Jasper town centre having places of interest pointed out, well that didn't happen. Having said that Jasper has such a small centre you can walk around and see most of it in a 1/2 hour or less. I thought the tour was a bit expensive but it was enjoyable and as I wasn't driving I was able to really enjoy the scenery. This tour was excellent. I booked through TripAdvisor which didn't seem to offer much information about the tour as far as the itinerary was concerned. Our driver and guide, Brad and Chris, picked us up from our hotel and we got on the very nice coach bus. There were only about 10 people on the tour with us, which was great! we made a few stops on the way and were able to take several pictures at each stop. Then we went to Maligne Lake for the boat cruise. You are with more people on the boat. The cruise was great! It was informative and the views were great. You do get a chance to grab some food before the cruise, which is nice. Then back on the bus! Brad gave us some GREAT suggestions on places to go hiking. Overall great tour and awesome guides! Very enjoyable and informative tour, both on the bus and on the boat ... Equally great. This is a great trip and an absolutely gorgeous lake! Highly recommend this tour. Keep in mind that if you drive yourself you have to find a place to park especially hard on crowded days. This tour gave us ample time to roam the different stops. Our tour guide was great. Get ready for one of the most beautiful trips of your life. Fantastic day. Maligne lake cruise was great. We saw a lot from the boat and the visited the Spirit Island which was beautiful. We had an informative guide as well. Our tour exceeded our expectations. Our driver and our guide were outstanding. They explained everything thoroughly. The bus was always where Andy, the driver, said it would be. He was willing to stop for animal sightings and would move the bus so everyone could get a glimpse. He willingly answered all questions asked. Excellent trip. Our driver was a mine of information, he even found a black bear and an elk by the side of the road for us! Weather could have been better on lake maligne but still a great day out. Definitely recommend !